← “Monument or Headstone 2”? 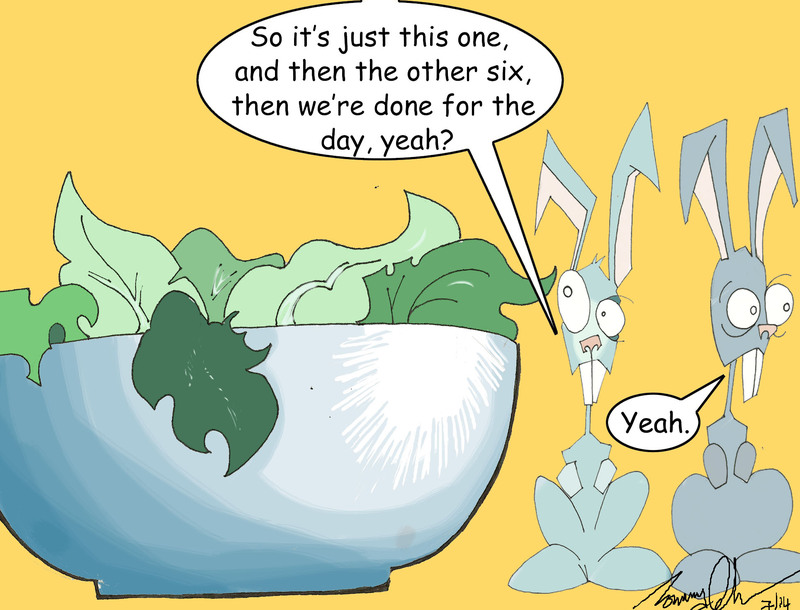 Speaking of rabbits, lettuce is another one of the healthy foods. You just have to eat a bowlful to make up your one a day. But not that juicy, cosmetically packed, hermetically sealed iceberg lettuce. That’s more water than nutritious. Best to have the green, floppy leaved type like Romain or Rocket which are rich in vitamin A. Not a lot more to be said about lettuce, except that when you have eaten a bowlful you may be one seventh healthier. I see red said the rabbits? What do you see? Green I said not with envy but with sore eyes. EMFV fans may note Johns fasination with everything green in the valleys, like the English countryside! Where oh where are those strident reds, yellows and too some extent pinks that one may add to a salad to enable the eyes to feast on a basket of fruit? Not just differnt shades of green? One had raddishes, peppers, tomatoes, peaches, melons, kiwi fruit, plums, raspberries, black berries, blue berries, applles of diffent hues, oranges, and then a few jersey royals, and if that is not enough choice, a dollop of baked beans to keep the fibre levels up. Ones diet need not be entirely that of a rabbit in the headlights? EMFV what does that stand for?? (My mind has gone I have forgotten? I need brain food to feed the mind?? Dream on Mac duff you are a wonderful chap, I hope you enjoy your rockets and little jem and COS.
Eureka EMPTY MINDS FLIT VACANTLY’ (EMFV@ is this ones eppitaff? I wonder, or is just an old wind blowing about and playing with the tumbleweed. I trust ones bowls are clear and in good order? By the way courtest Good Morning Kind sir? and good morning to any readers of this column. Have a good day!! I am off to enjoy the sunshine, and some more EMFV! Is It I or my spelling BOWELS? Kind sir!! I have made a horses arse of my comments / wish you well Tat Tah for now.